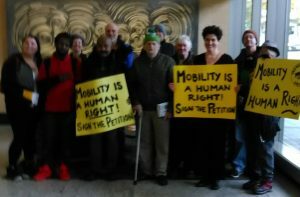 On Thursday, March 14, we learned that Sound Transit has quietly been taking steps to contract out their bus service to a private, for-profit corporation. This is unacceptable for so many reasons. Privatization of public transit is a profit-grab that in other cities has led to eroding service and safety standards, not to mention that any “savings” usually come from turning middle class union bus driver positions into lower-wage jobs with worse benefits. Contracting out to a private company also undermines public oversight, transparency, and accountability. 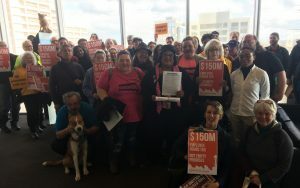 TRU and allies sounded the alert and hundreds of people emailed Sound Transit Boardmembers urging that they halt the privatization plans. Guess what? The board listened. Sound Transit has agreed to “pause” the RFP (request for proposals) to allow for a thorough discussion among boardmembers and with King County Metro, which currently operates the Express service; labor partners like ATU 587, which represents Metro drivers and mechanics; transit rider organizations like TRU; and the public. We are hopeful this pause will allow for a productive dialogue and a better outcome. We believe that together we can tackle challenges like the need for additional bus base capacity, while keeping public transit public, maintaining transparency and accountability, and without eroding service and labor standards. We will stay vigilant and keep you informed as this conversation continues. The next public discussion will be at the Sound Transit Board’s Operations Committee meeting on April 4, 1-3pm at Union Station. Again, THANK YOU to everyone who took action. When we organize, we win! TRU’s Annual Event asks: Whose City Is This? 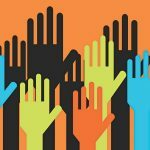 Who really holds power in Seattle, King County, and our region? How do they wield it? How can we act strategically to win as much as we can, while also building new democratic, accountable power for people-powered movements? Join us at 1:00pm on Saturday, March 2, to explore these questions at TRU’s Annual Event & Meeting. We’ll draw some lessons from recent victories and defeats and discuss what comes next. The event will take place at the Seattle Labor Temple, Hall 8, 2800 1st Ave. First there will be a public event, open to all, 1:00-3:00pm. Speakers and details TBA. Then, after a short break, TRU will hold our Annual Meeting from 3:30-4:30pm. The meeting part is members-only. 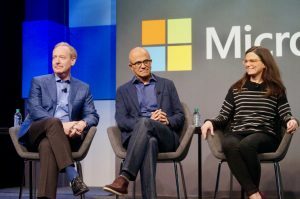 You probably saw the big news last week: Microsoft has pledged $500 million to tackle the housing crisis in King County, after discussions that began in the wake of the big business tax repeal last spring. How should we feel about this? On the one hand, this is a lot of money, and although much of it is in the form of loans, it should speed up the production of affordable housing and help a lot of people. On the other hand, as our friends at the Economic Opportunity Institute have explained, relying on philanthrophy to solve social inequities is deeply problematic, undermining democracy and giving wealthy individuals and corporations far too much power over all of us. Third, and perhaps most important as a lesson for us: As the news coverage makes clear, this happened because of the “head tax”— because of the work that TRU and Housing for All and many others did last year pushing for a tax on big business. Deep-pocketed corporate opponents successfully fought to kill the tax, but we successfully built up a public expectation that they do more to address the housing and homelessness crisis that their growth is driving. So let’s take this as a victory, even as we recognize that corporate largesse is not the ultimate answer and it’s our job to figure out the next step forward! 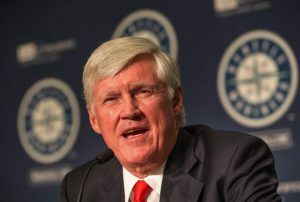 Today the Seattle Mariners announced the “Home Base Partnership” to create a several million dollar revolving fund for eviction assistance and prevention, a move housing advocates say is a response to public pressure and a victory for community organizing. The billion-dollar corporation’s newfound interest in the housing crisis emerges in the wake of a pitched battle with affordable housing advocates over the disposition of the county’s lodging tax revenue earlier this year. 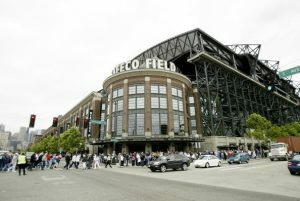 In May, County Executive Dow Constantine proposed that $185 million in lodging tax funds be spent on maintenance and upkeep of Safeco Field, the Mariners’ stadium. 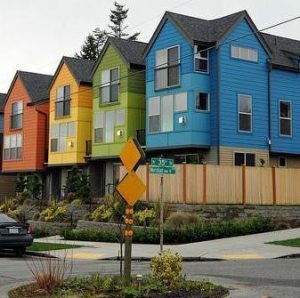 The proposal sparked an outcry from King County residents and advocates who argued that this public money should instead be used to address the region’s deepening housing and homelessness crisis. Over 80 organizations signed a letter to County Councilmembers urging them to prioritize basic human needs over stadium improvements that amount to subsidizing a profitable private corporation. In September, after several overflowing public hearings, the King County Council voted 5-4 to allocate $135 million to Safeco Field. In a partial victory for the housing movement, the compromise bill also directed $165 million more to affordable workforce housing and services for homeless youth than the Executive’s original proposal. What happens when you can’t afford a transit fare and you need to get to a doctor appointment, a job interview, or a shelter? Maybe you pray that the bus driver will be kind and let you board. Or maybe you get caught by fare enforcement, slapped with a steep fine and kicked off the train far from your destination. Maybe you ask passers-by for change and bear their suspicious looks. Maybe you’re lucky enough to find a service provider to give you a free ticket or two. Or maybe you just end up walking for hours. Thousands of King County residents face these tough choices every day. The stress and time wasted when you can’t reliably get from A to B make it extremely difficult to overcome the many other challenges that people with very low incomes face in our increasingly unaffordable region. 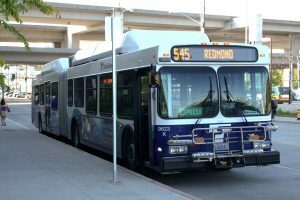 As wonderful as the ORCA LIFT reduced fare program is, it doesn’t meet the needs of riders who can’t easily pay $1.50 per ride or $54 per month for a transit pass. Here at the Transit Riders Union, we are celebrating because this week we took a major step towards making our public transit system affordable for all. 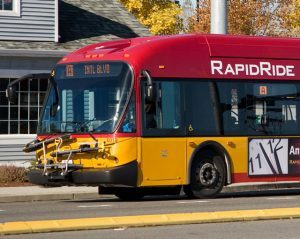 The King County Council voted to take steps to implement low/no-cost transit fares for Metro’s lowest-income passengers, with the goal of having this new program in place by 2020! Our big job next year, 2019, will be to work with King County Metro and elected officials to create a robust and well-designed program. This is a huge deal and a great way to end 2018. (Not that we’re done yet… stay tuned for some big news next week!) Want to celebrate with us? Come enjoy music, food and drink, and great company at TRU’s happy hour fundraiser on Thursday, Nov. 29 —RSVP here. 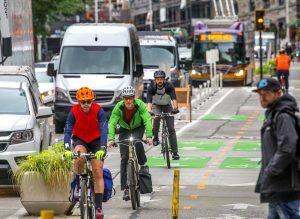 TRU has joined with transportation and climate allies to form a new coalition called Move All Seattle Sustainably (MASS). 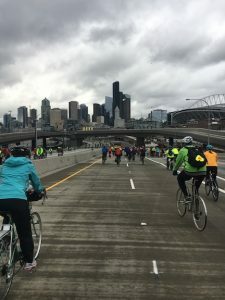 Last week we sent a letter to Mayor Durkan and the City Council, asking that they work with us and act boldly to transform Seattle’s transportation system. Check out the news coverage of our launch in the Seattle Times, Seattle Weekly, and Curbed Seattle, and Capitol Hill Seattle Blog. We’ve come together with a sense of urgency. We see the climate crisis and the recent IPCC report telling us that catastrophe awaits if we don’t act now to cut carbon emissions. We see the viaduct closure looming early next year, and we know that traffic, especially downtown but throughout the city, is about to get even worse as we enter the “Period of Maximum Constraint”. Seattle must act fast to prioritize the modes that move the most people in the least space, and with the lowest carbon impact. That means public transit, biking, and walking — making it easy, safe, and fast for people to get around the city without driving. Stay tuned for our next steps, because we’re going to need your help. 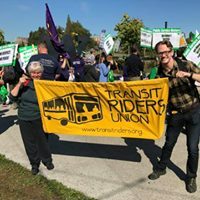 Thousands of UW Workers Win Transit Passes! We did it!! After many months of public pressure, phone calls and petitions, emails and op-eds, rallies and direct actions, several UW labor unions emerged from contract negotiations last week with an agreement that includes 100% employer-paid transit passes starting July 1, 2019. This victory will increase transit ridership, lower carbon emissions, ease gridlock, and make life better for thousands of workers struggling with the high costs of living in our region. We showed that when workers, transit riders, and the community stick together, we win. Thanks so much to everyone who took action to make this victory possible. And stay tuned for a little mop-up operation — we’ve got some work still to do to make sure this benefit is extended to every single UW employee. Thank you to everyone who emailed and called City Councilmembers over the past few days. On the afternoon of Monday, June 25th, after testimony from TRU members and from our friends at ATU 587 (the union of Metro bus drivers and mechanics), the council voted to strike the Mayor’s proposal to contract with a private transit provider. 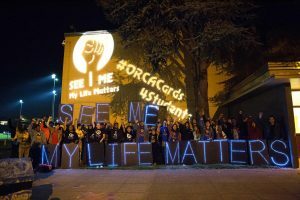 With that ‘poison pill’ removed, the council then voted unanimously to free city transit dollars to make infrastructure improvements that will improve speed and reliability; and to fund student ORCA passes, expanding on the victory won by Rainier Beach High School students, with TRU’s support, in 2015. This will make Seattle the largest city in the country to provide free, year-round transit passes for all high-school students! That same Monday we also testified at King County Council meeting, in favor of a motion written by Councilmember Rod Dembowski’s office in collaboration with TRU. This motion directs Metro to deliver cost estimates for new programs that would make public transit more affordable and accessible for youth, college students, very low-income and homeless folks, low-wage workers, and residents of low-income housing — all causes we have been championing for years. The motion passed unanimously, setting us up for progress during this fall’s budget process. With that, TRU is taking a long-overdue break for the month of July. We will be back in action in August, ready to resume our work on decriminalizing fare enforcement, improving Access Paratransit service, winning free transit passes for UW workers, and more. See you then! 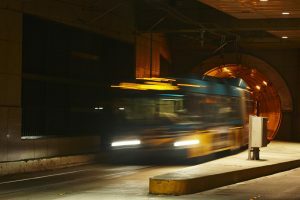 The City of Seattle is considering a proposal to divert public funds intended to buy additional Metro service hours to private contractors. This proposal is part of a larger package of changes to the Seattle Transportation Benefit District, which will be decided on Monday, June 25th. 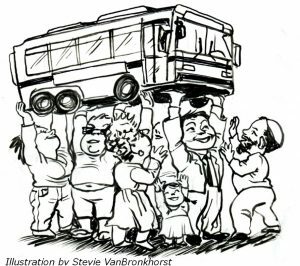 Why would the City even consider contracting with a private bus service provider? The stated reason is that additional peak service is needed to ease congestion during the upcoming “Period of Maximum Constraint”; and King County Metro claims they are unable to provide this service. However, the experience of other cities shows that privatization is a slippery slope, and we believe the costs and risks of setting up a private system that parallels and supplants King County Metro far outweigh the potential benefits. We believe the City Council should reject this proposal and instead work with SDOT and Metro to reassess the possibilities of adding publicly-operated service, and implement street improvements such as dedicated bus lanes and other strategies to reduce congestion. 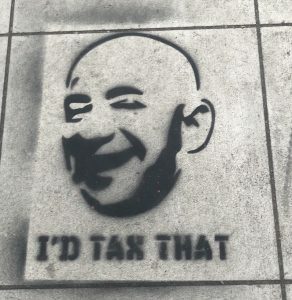 Jeff Bezos 1, Homeless People 0. Now What? In a special meeting Tuesday afternoon, city councilmembers voted 7-2 to repeal the big business tax they passed unanimously just four weeks ago. National news quickly filled with blistering headlines, slamming Seattle’s swift capitulation to Amazon’s bullying tactics. There’s no sugarcoating it, we lost. But progress is never easy, or achieved without failure and the courage to persist through failure. We set out to do something big. Over the past nine months we have disrupted a status quo that protects the wealth and privilege of the few and leaves the rest of us fighting each other for scraps. What is remarkable is that we got so close. Our challenge now is to draw lessons from this experience, regroup, and move forward. Next time we will win. In the wake of yesterday’s vote, many of us feel not just deep disappointment but anger and a sense of betrayal – how could our progressive allies on the city council, who stood with us and worked with us over the past nine months, cave so suddenly and so completely? At least three of the councilmembers who voted to repeal the legislation – Lisa Herbold, Mike O’Brien, and Lorena González – did not do so because they changed their minds about it being good policy or the right thing to do. They did so because they knew that the big business-funded referendum push had gathered enough signatures to make the ballot; and they saw ahead five more brutal months of a multi-million dollar propaganda war ending, they believed, almost inevitably in defeat. They know very well that new resources are needed to address homelessness – and yet they have had no qualms about denying this again and again. They have drowned out facts with well-funded lies. They have, it seems, successfully turned the tide of “public opinion” – at least among likely voters. Seeing this, councilmembers chose to cut their losses and start over. Yesterday Amazon, Starbucks, Vulcan, and the big business lobby groups got their way. They “won”. Who lost? Most of all, our neighbors experiencing homelessness: low-income seniors, veterans, at-risk youth, people struggling with mental health or substance use challenges, and people with disabilities, whose one shared characteristic is that they cannot afford a roof over their head in this insane housing market. Seattle, Let’s Close the Housing Gap! Remember last fall, when TRU and Housing For All started pushing for a big business tax to fund housing, shelter and services? If passed this bill will raise $75 million per year, three times what was proposed last fall. 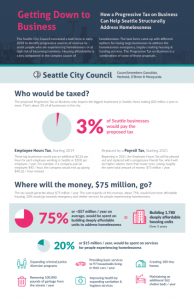 The tax will affect only approximately 3% of businesses in Seattle, those with annual revenue of $20 million or more. Of the new funding generated by the tax, fully 75% will go to housing, 20% to shelter and services. This legislation is a once-in-a-generation opportunity for Seattle to take a real step towards closing the affordable housing gap and addressing a root cause of the homelessness crisis. We hear a lot of talk these days about affordable housing and how there’s not enough of it. But just how serious is this shortage, and what tools does the City of Seattle have to do something about it? This event will explore the “housing gap” and its implications for our quality of life and the future of our City. We will focus especially on households in the lowest income bracket, 0-30% of Area Median Income (AMI), who may be homeless or at the greatest risk of homelessness. A presentation and round-table discussion will be followed by public comment. We are at a crossroads in Seattle’s history. As population and housing costs surge, the inseparable crises of homelessness, housing insecurity, and displacement deepen. We can’t solve these crises without far more affordable housing. In order to meet the need, Seattle must build approximately 20,000 more homes affordable to low-income families and individuals in the next ten years . Due to pressure from the Housing For All Coalition, the City Council has formed a Progressive Revenue Task Force to recommend funding sources, such as a tax on big businesses, to create new housing, shelter and services without further taxing working and poor people. We can win this by the end of March – but only with your help. Join us on January 31st to learn more, get involved, and take actions that day that advance the campaign!